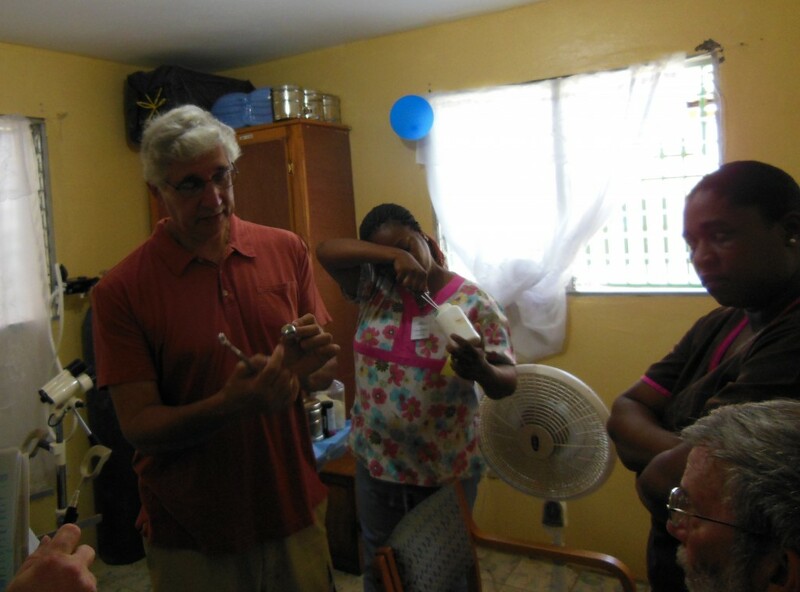 Dr. Michael Viola explaining instruments used to eradicate cervical pre-cancer. Cervical cancer has decreased dramatically in the developed world, largely as a result of screening and treatment programs. However, the disease remains a major cause of death in the developing world, accounting for 530,000 new cases, and 270,000 deaths per year. Haiti, which is the poorest country in the Western Hemisphere, has the highest cervical cancer rates in the world (94 cases per 100,000 women). The major reason for Haiti’s extraordinarily high cervical cancer rate is the lack of access to effective prevention, early detection, and treatment programs. The prevention of cervical cancer is of critical importance in Haiti since facilities for the treatment of advanced cervical cancer, the stage most cervical cancers are detected in Haiti, are virtually non-existent. In March 2010, MFP implemented a strategic plan to decrease deaths from cervical cancer in the Gros Morne region of rural Haiti. This major health initiative, in a sense a demonstration project, has proven to be cost-effective, sustainable, and capable of rapidly scaling up geographically. Provide continuous community education. Our nurses and community health workers encourage cervical cancer awareness and promote our prevention program before women’s groups, in churches, in the market, on the radio, and by public announcements in villages. The message is specifically directed to cervical cancer prevention, but broadly encourages women to take responsibility for their own health. Build a durable infrastructure. A successful program demands establishing a referral network of accessible, competent cyto-pathologists, radiologists, and cancer surgeons. The consultants assist in the diagnosis of pre-cancer and invasive cancer, and can perform curative cancer surgery. When local expertise is needed, but not available, e.g. palliative care, our nurses assume that responsibility. Program funds are budgeted to pay for patient transportation, tests, consultations, medication, and surgery. Health care is expensive in Haiti, and too many Haitians die because they do not have the funds for proper treatment. Promote women’s health, not just cervical cancer prevention. In addition to screening and treating early cervical cancer we obtain a medical history, screen for breast and abdominal cancer, diagnose and treat sexual transmitted infections (STI’s), and refer patients for appropriate treatment. To insure a consistently high level of care, we developed an MFP Clinic Manual containing a set of screening and treatment algorithms that are followed by all physicians and nurses working in the program. Bring services to remote areas. We attempted to centralize services at the Alma Mater Hospital, but some women were unable to travel long distances to the hospital. In response, we developed a mobile clinic that travels twice monthly to 7 remote mountain dispensaries. Establish a computer based monitoring and evaluation program. We maintain patient data on spreadsheets to monitor disease incidence, complication rates (after cryosurgery), patient compliance, and follow-up rates. We share a common database with the AIDS program so all HIV+ women are scheduled for periodic colposcopic exams. To minimize the number of patients lost to follow-up, we developed a computer-based patient tracking system that alerts us to patient return visits, pending laboratory results and consultation reports. These rigorous quality assurance measures are an attempt to change hospital culture in Haiti, and encourage administrators to initiate hospital wide quality assurance programs. This program is easily transportable to other parts of the developing world. This entry was posted in Uncategorized by mviola. Bookmark the permalink.